Baby can travel in style in this stroller which features a five point harness, larger canopy with "peek-a-boo" window. 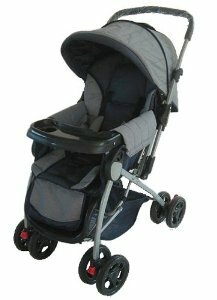 The seat back folds flat and has a pop up safety frame for use as a carriage for smaller infants. The handle can be pivoted to allow viewing of baby while going for a stroll. Medium Blue Accent with Pewter Gray Base.